Are toddler tantrums a serious ethical issue? Eric Schwitzgebel on Are toddler tantrums a serious ethical issue? Jessika on Do we have a moral obligation to host refugees? What Kind of Jerk Are You? | Daily Nous on What kind of a jerk are you? Posted on: July 19, 2015 in Politics by henrys13_wp. I still vividly remember the first time that I felt threatened online. Back when I was thirteen or so, I was an avid player of an online game called Ultima Online which took place in a persistent virtual world, (much like the modern equivalent, World of Warcraft). I made friends in the game, spent many hours questing and exploring, and even joined a guild. Late at (virtual) night over a (virtual) campfire, my guildmates and I would trade stories with each other about ‘player killers’ (PKs, for short) – gangs of high-level players who specialized in hunting and killing inexperienced characters like ourselves. Most of the time, I spent my days safe within the cities or within the designated ‘safe’ areas where players couldn’t attack each other. Then, one day, I decided to venture further, to explore the lucrative dungeons further out in the wilds. I was in the middle of fighting my twentieth skeleton or so when a gang of high-level players who appeared from nowhere. Yelling taunts like “get the n00b” and “fireball him”, they mercilessly killed me and took all my stuff. It might seem ridiculous to say that was a threatening and unpleasant experience. After all, even as a privileged kid growing up in rural England, I’d experienced much worse in real life – as an overweight nerd, I was no stranger to bullying, intimidation, and social exclusion. Still, my experience online was genuinely upsetting. The equipment I’d spent many weeks collecting was looted by my killers, and I didn’t feel safe playing the game for a long time, a fact which took its toll on my online friendships. But I recognized there was a difference between the kind of unpleasantness I’d dealt with in real life compared to that I encountered in the game. What had happened to me didn’t strike me as unacceptable or problematic. I knew the risks going in; I knew that when I left the safe spaces of the cities, I was putting myself at risk of being attacked. It’s tempting to draw an analogy between my experience and certain kinds of unpleasant exchange that happen in online forums. If I decide to post an opinion on forums like 4chan or reddit, I know in advance that there’s a chance people will be cruel, mocking, and derisive about both me and the content of my contributions. In both cases, there may be real psychological harm sustained. But that’s the risk you take when you decide to leave highly regulated environments and swim out into open waters. Obviously, my unpleasant experience with Ultima Online is a world away from some of the online abuse that’s been making the news. I’ve heard many accounts over the last few years of friends (especially politically-engaged female friends) receiving hatemail and threatening messages on twitter. More recently, reddit has been in uproar ever since its former CEO, Ellen Pao, decided to ban several unpleasant subreddits for activities related to harassment. Certainly, there are kinds of online harassment that are clearly abusive – sending repeated undesired private messages telling someone to kill themselves (or worse), tracking them across multiple websites and sending them hateful messages, or leaking their real life details (a practice known as ‘doxxing‘). Websites have a moral obligation to try to protect users from this kind of abuse, both by banning abusive users and giving people the tools to block unsolicited messages as they see fit. But there is a careful line to be drawn here. Sites like reddit offer unparalleled freedom of speech and the protection of anonymity. That’s not an unqualifiedly bad thing: people can explore new identities and espouse ideas that they’d be scared of voicing in less anonymous, more carefully moderated forums. They can also just be massive jerks, taking pleasure in insults and trolling, using all manner of unpleasant slurs against one another. It’s great that there are places where people can interact with one another without having to face this kind of unpleasantness, especially when it’s tinged with racism or sexism. But there’s also something to be said for the kind of radical license permitted by the internet’s wilder places. The kind of crude play you find there might not be pretty, and can be genuinely hurtful, but it’s valuable to many of those who engage in it. Moreover, free speech and anonymity cut in many different directions; subreddits like /r/shitredditsays, for instance, are dedicated to brutally exposing and ridiculing users who have posted bigoted and prejudiced content in the first place. As long as all this plays out in a public forum between consenting adults, and doesn’t turn into sustained private attacks against an individual, this kind of speech should be seen as belonging to the same protected realm of speech as more established forms of satire, mockery, and ridicule. 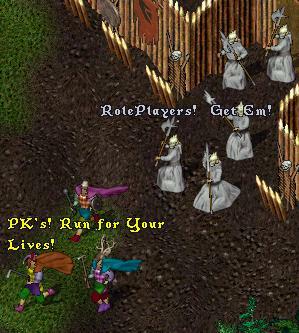 I did eventually return to Ultima Online. I’d like to say that I trained for many months Batman Begins-style and brought my killers to justice. Alas, that didn’t happen; I was killed many more times by PKs before I eventually moved on from the game. But I also grew more resigned to the risks, and learned how to better protect myself when I was outside the safe spaces of the cities. Since then, I’ve also suffered my fair share of scorn, mockery, and even minor harassment in many other contexts on- and offline. In both cases, however, the unpleasantness I’ve suffered has made me a more resilient individual, better adapted to the messy, chaotic, and intrusive world we live in. If only for that reason, I have some perverse gratitude for the PKs who killed me back in ’96.